Featuring golf course or land views, this 50-square-metre one-bedroom accommodation is equipped with a French or twin bed, 55-inch mirror LED TV, shower, bathtub, sitting area, working desk, dressing room and a 12-square-metre balcony. Featuring breathtaking sea views, this 50-square-metre one-bedroom accommodation is equipped with a French or twin bed, 55-inch mirror LED TV, shower, bathtub, sitting area, working desk, dressing room and a 12-square-metre balcony. 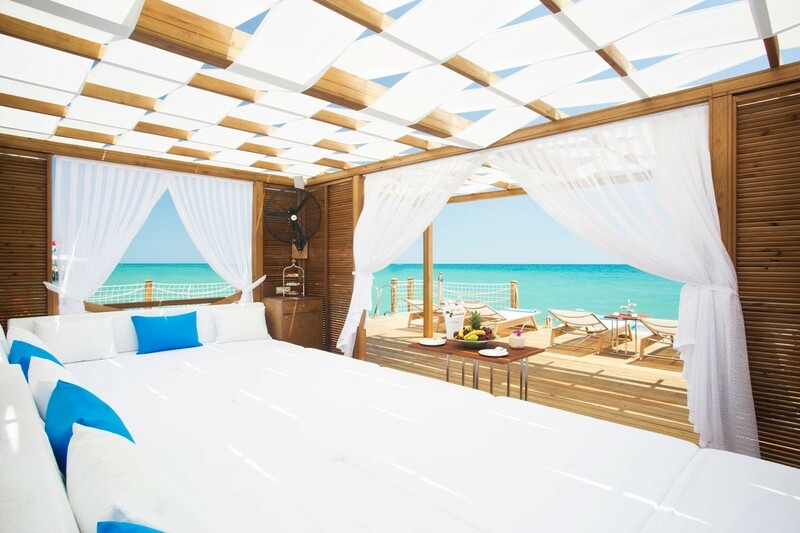 Featuring breathtaking sea views, this 100-square-metre suite offers one bedroom, a living room and two bathrooms. Ensuite comforts include a French bed, a sofa bed, 55-inch mirror LED TV, Nespresso coffee machine, working desk, maxi bar, dressing room and a 24-square-metre balcony. Featuring land or sea views, this 85-square-metre room offers two bedrooms and two bathrooms. 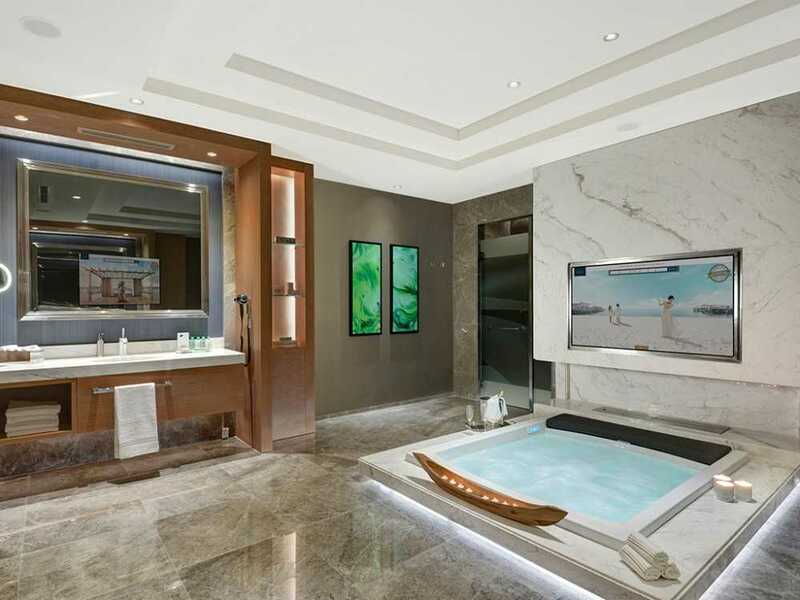 Ensuite comforts include a French bed, two single beds, two 55-inch mirror LED TVs, dressing room, shower, bathtub and a 24-square-metre terrace. Featuring breathtaking sea views, this 150-square-metre suite offers two bedrooms, a living room with dining table and two bathrooms. 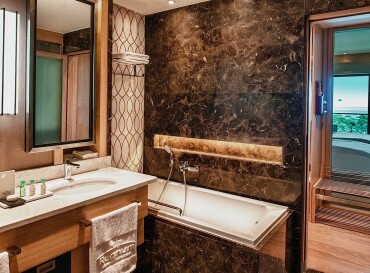 Ensuite comforts include two French beds, a sofa bed, 55-inch mirror LED TV, dressing room, maxi bar, Jacuzzi, Nespresso coffee machine, shower, bathtub and two 36-square-metre balconies. This 50-square-metre room features a bedroom with French or twin bed, 55-inch mirror LED TV, working desk, dressing room, shower, bathtub and a garden terrace with a pool that is shared with guests of the other Golf Room. This 100-square-metre suite offers one bedroom, a living room and two bathrooms. Ensuite comforts include a French bed, a sofa bed, 55-inch mirror LED TV, Nespresso coffee machine, working desk, maxi bar, dressing room and a garden terrace with a private pool. This 100-square-metre room features one bedroom with a French bed, a second bedroom with two single beds, two 55-inch mirror LED TVs, working desk, dressing room, bathtub and a garden terrace with a private pool. 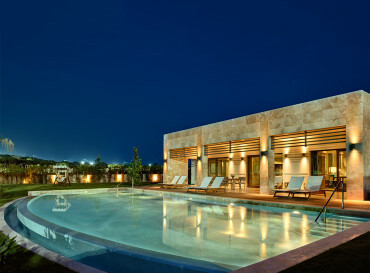 Baron Villas, designed for six adults as well as children and infants, are located inside the Carya Residence. Each Villa comes with a 100- square metre private heated pool, a private terrace, a living room, a kitchen and a powder room, and two bedrooms offering dressing rooms, and en suite bathrooms with showers and bathtubs. Every item a family might need, including an ironing board, a washing machine and a microwave, is considered. This 300-square-metre villa features one bedroom with a French bed, a second bedroom with two single beds, a third bedroom with two single beds, a living room, a kitchen with dining area, shower, bathtub, working desk, dressing room and a 140-square-metre heated swimming pool. Additional services include VIP roundtrip airport transfer, VIP check-in, butler service, complimentary room service, golf car service and VIP bar setup. Located by the golf course, with pool views, the King Villa features five bedrooms, five bathrooms, a living room, sitting area, work desk, dining area a 100-square-metre private terrace and a 200-square-metre private pool. Located by the golf course, with pool views, the five-bedroom Crown Villa features a terrace, living room, dining area, fireplace, private spa center (with sauna, Turkish Bath, Steam room, Fitness Center), Italian design kitchen, outdoor Jacuzzi, floor heating system, Jacuzzi and sauna in the master bedroom, terrace+bar, meeting room, fully equipped kitchen, complimentary room service and a la carte restaurant usage, food and drink service at Carya Golf Club, private butler, VIP transfer with Helicopter (max. 4 people), bulletproof windows, private car parking area and an outdoor Jacuzzi. Additional services include VIP roundtrip airport transfer with helicopter (up to 4 people), VIP check-in, 24-hour butler service, complimentary room service, golf car service and VIP bar setup, private Mercedes Maybach car service with a driver (can be used only in Antalya region). Located in one of Turkey’s most idyllic regions, where countless shades of green blend into the deep blue waters of the Mediterranean, Regnum Carya Golf & Spa Resort serves its guests with an approach to service that is beyond the ordinary. And, in its first year, Regnum Carya Golf & Spa Resort has become the most favoured resort hotel in Turkey and the Mediterranean. 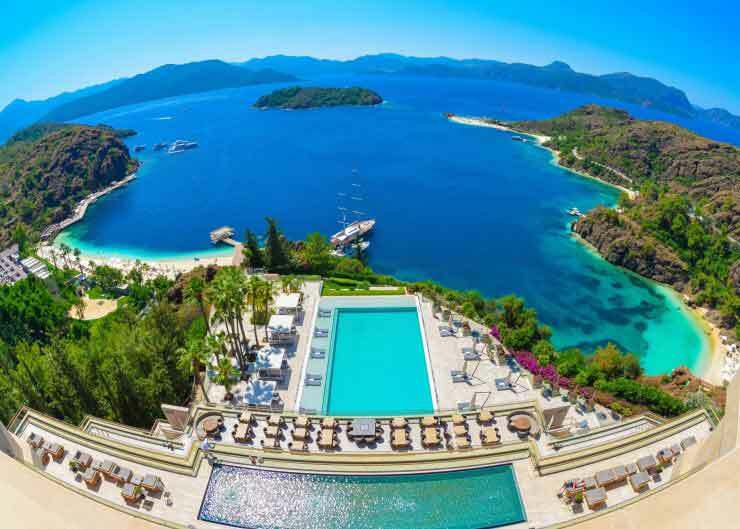 Opening its doors in April 2014, the Resort, from its first moment, aimed to deliver a breath of fresh air to the all-inclusive concept and to service quality in Turkey. 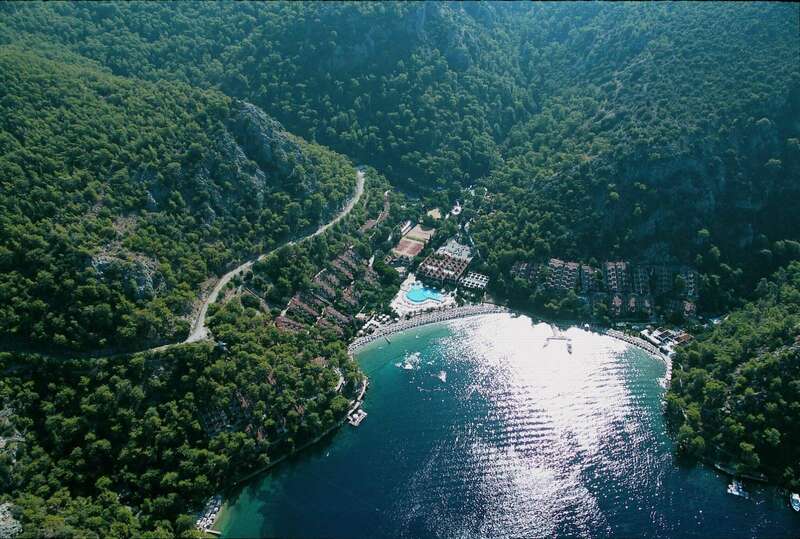 Together with Carya Golf Club, the Resort is set on one million square meters. With a classic luxury approach, room sizes that range between 62 and 200 square metres, and VIP services even in standard rooms, guests will feel entirely at home. Regnum Carya is the ideal destination for those who want to embrace nature and the sea amid luxe surroundings and extraordinary service. The property offers a unique experience to guests, with a 4,800 square metre fitness and SPA centre, á la carte restaurants, illuminated golf courts, swimming pools, water parks and an adventure park. A gift from the Öztürk Group to the tourism sector The Öztürk Group, operating across a range of areas and, particularly, in the energy sector, presents guests with a world in which every detail is carefully considered, and the VIP service approach is applied to each and every individual. 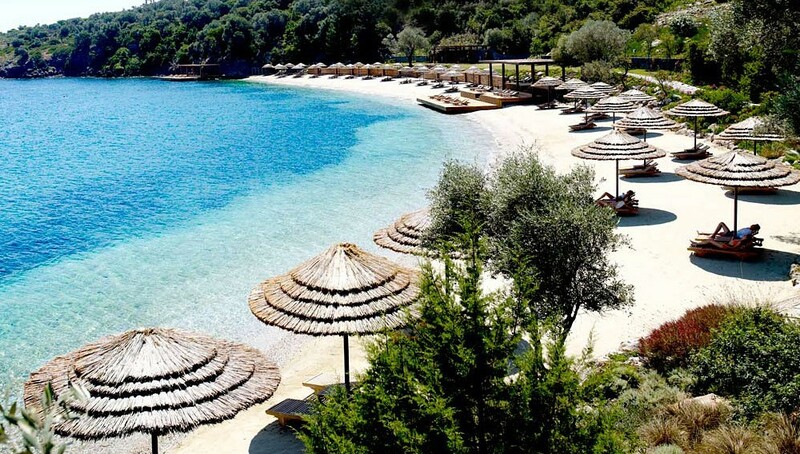 Constructed by Regnum Turkey, exterior and architectural design by Profil Mimarlik, and interior design by Arketipo Mimarlik, the Resort’s structures blend state of the art technology with a magnificent, yet understated, elegance. Regnum Carya Golf & Spa Resort has eight different types of rooms; in addition to the five-floor main hotel, there are single floor “Golf Residence” rooms that offer distinct services to guests, with private swimming pools. With the firm belief that sustainability is also robust business strategy, Regnum Carya Golf & Spa Resort is honoured to be the first golf hotel in Turkey with LEED Gold certification. Set amid a green pine forest, the hotel recycles shower and rainwater with a grey piping system. The 90-metre-long outdoor swimming pool, heated with waste steam energy, offers our guests the opportunity to swim outdoors in the winter season, while wide glass windows in almost every area, including the expansive 2,100-square metre ballroom, allow sunlight for natural lighting. The Regnum Carya Golf & Spa Resort offers a holiday filled with sport: from football to golf, and from an adventure park to a fitness centre. Hosting camps and trainings for some of the world’s premier football clubs, Regnum Carya Golf & Spa Resort stands out, offering three football fields that comply with FIFA standards. Every detail is considered for families who are on holiday with their children and infants. Regnum Carya offers a kids’ club, a special adventure park, a dedicated children’s aqua park, and a state-ofthe-art games hall, along with many more fun, educational activities. Babysitting services are also available. The Convention Centre, serving the corporate community with the same outstanding service and quality approach as Regnum Carya, is distinguished from other convention centres with a capacious area of 7,500 square metres; and windows and doors with external access. The Centre is extensive enough to host large events, and it offers one of the most spacious ballrooms in Turkey. This vast 2,100-square metre ballroom provides advantages that exceed those of many other ballrooms, including excellent acoustics, direct sunlight, and a space free of obstructing columns. 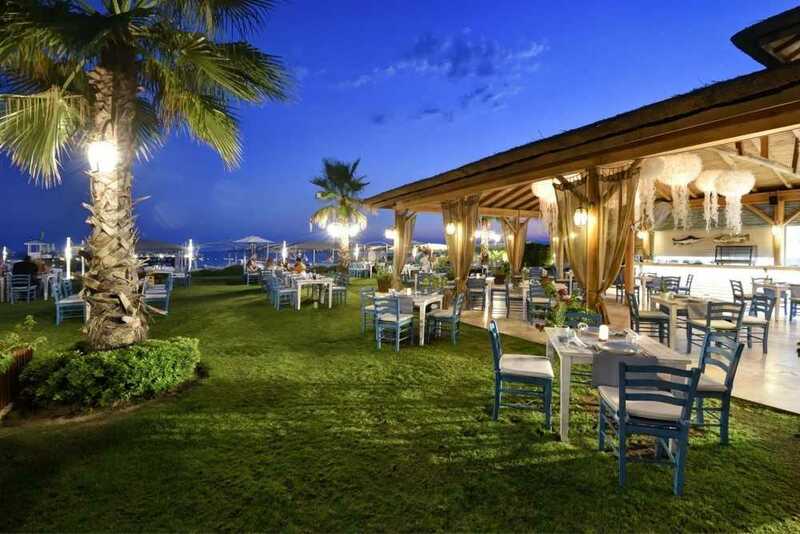 Set against a backdrop of Mediterranean and golf course views, the all-inclusive restaurants at Regnum Carya Golf & Spa Resort are renowned among the best places to eat in Belek-Antalya, Turkey. Guests of our 5-star hotel are welcome to delight their palates by exploring them all. From our Gourmet Main Restaurant to a diverse selection of international restaurants, signature cuisine and sophisticated ambience create a memorable setting for breakfast, lunch and dinner. Serving an open buffet concept for breakfast, late breakfast, lunch and dinner, our Gourmet Main Restaurant boasts a stylish décor and rich food corners. In addition to an indoor dining room and outdoor terrace, the restaurant offers a separate kids restaurant, a baby station and a diet corner.Guests are greeted with champagne during breakfast and children are served first. All drinks are served to table. Named to honour the Italian word for “sunset,” Ristorante Tramonto serves authentic Italian cuisine in an elegant Mediterranean-inspired setting. Boasting an exotic Far East-style ambience and authentic Teppanyaki* tables, where Teppanyaki masters demonstrate their skills, Chufang promises an unparalleled dining experience. Please note: *Teppenyaki is offered as an additional charge and not as part of the all-inclusive dining options. Visit the Seahorse seafood restaurant to savour fresh fish dishes complemented by Mediterranean greens and the sound of the Mediterranean surf. The Ottoman Restaurant combines the rare tastes of traditional Turkish cuisine with a simple but stylish atmosphere steeped in Turkish culture. Authentic Brazilian style steakhouse, or “churrascaria” with rodizio service. Restaurant only opens in summer season. 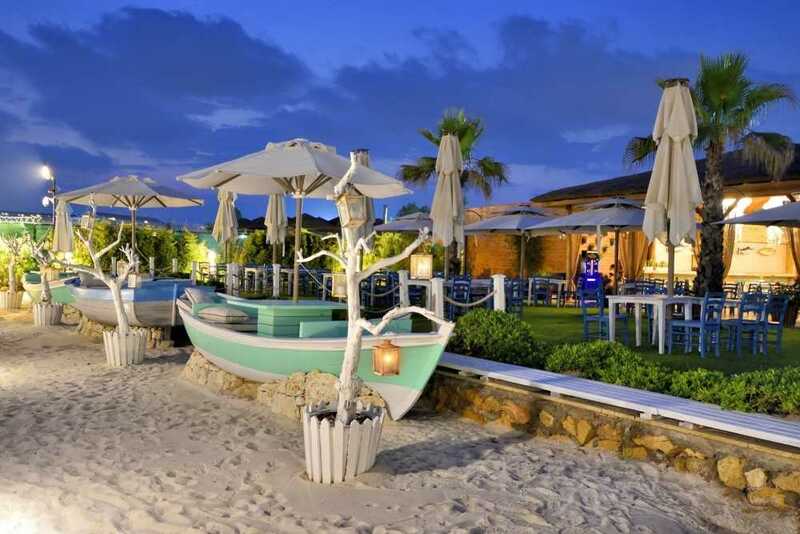 Traditional Mediterranean fish restaurant, located on the beach, serving fish, Mediterranean appetizers and desserts. Sandal restaurant opens only in summer season. Located in the lobby, this bar is open year round 24 hours a day. Located on the first floor, this vibrant sports bar features flat screen televisions broadcasting football, rugby, tennis, golf and more. Located in the lobby, this bar features a small putting area for golfers. Located on lobby floor, open whole year this traditional Irish bar is the perfect spot for enjoying a nice cold pint of Guinness. Located in the spa center, this year round vitamin bar operates when the spa is open. Located on the first floor, this club features DJ performances every night. Located on the pier, this bar is open only in the summer season (May 1st – Septemeber 30th). Located next to the heated outdoor pool, this pool bar is is open only in the summer season (April 1st – October 31st). Green Door Spa & Wellness at Regnum Carya Golf & Spa Resort is one of the top hotel spa and wellness centres in Belek-Antalya, Turkey – an oceanfront sanctuary of tranquillity and serenity. Our professional spa therapists can help you select from a range of massage, skin therapy and beauty treatments – all performed in our exquisite spa centre. During a time when natural resources necessary for vitality and longevity are facing extinction, we are AWARE that our role in the healing and protection of nature is crucial in order for us to have a better quality of life. As GreenDoor Spa & Wellness, we believe that nature is the source of beauty, and along with our mission, we have positioned ourselves within its balance and harmony. In GreenDoor Spa & Wellness, we offer a wide variety of organic and natural treatments, while using products which will contribute to your natural beauty and health. Among our selection, you will see products which are organic certified, against animal testing, respectful to nature, and use recycled packaging. Boasting three football fields designed to meet FIFA standards and a world-class tennis facility, Regnum Carya Golf & Spa Resort offers an extraordinary destination for football and tennis enthusiasts seeking to improve their games. Guests of Regnum Carya Golf & Spa Resort can enjoy memorable golf holidays at two courses: Carya Golf Club, which is Turkey’s first and only golf course allowing nighttime golf with 18 floodlit holes, and Belek’s first golf club, the 27-hole National Golf Club. Both courses have been constructed by top American international architects and complement extensive practice facilities with a fully serviced Clubhouse. This, coupled with an international management team and staff of PGA golf professionals, ensures that Regnum Carya Golf & Spa Resort can rightly take its place as the leader in Turkish golf. With three football fields designed to meet FIFA’s official standards, Regnum Carya Golf & Spa Resort offers a top-class training facility for sports lovers seeking to become the football stars of tomorrow. The resort additionally offers training camp facilities for national and international football teams. In addition to the three 68 X 105 football fields, facilities include a 320-square-metre clubhouse with two separate dressing rooms and two storage rooms.